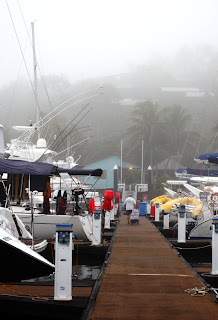 Well here we are, MrJ and me still sitting in the marina on Hamilton Island. At least the rain has stopped and the sun has been trying to shine. Every morning we have been fogged in, Saturday morning being the worst, bringing down a pea-souper fog till late morning with drizzly rain in the early morning. When the fog began to lift letting small amounts of sunshine MrJ and I went for a walk. The cloud cover over the islands was still fairly low, low enough to be just touching the top of the highest hills with a blanket of mist in and around some of the waterways between the islands. Friday it rained all day making everything wet, wet, wet and miserable. On the brighter side of life we have met some really wonderful people in the marina. The family, two doctors and their teenage daughters, on a boat in the next berth are extremely friendly and generous people; today they catch a flight out to go back to work. The berth behind us has hard a run of charter boats coming in for one night’s stay then leaving the next morning. Thursday night there was a group of young males, all mates from years ago at Uni, who meet up once every year in a different location on a Lagoon40 catamaran. This year they chose the Whitsundays, next year it could be Moscow as one of the lads had suggested after a few too many rums. Hahaha! Friday night we had another family group with teenage kids on a Seawind1000 catamaran. Two of the boys slept in the saloon leaving the plastic curtain open. I wondered if the wet foggy air got to them like it had come into our covered cockpit saturating everything again. So far today that berth is empty but the day is not over and we may well get another boat by late this afternoon. Another person we ran into was Daniel who used to work at the MBTBC Marina in Manly QLD where we base ourselves for our medical checkups in the between seasons. 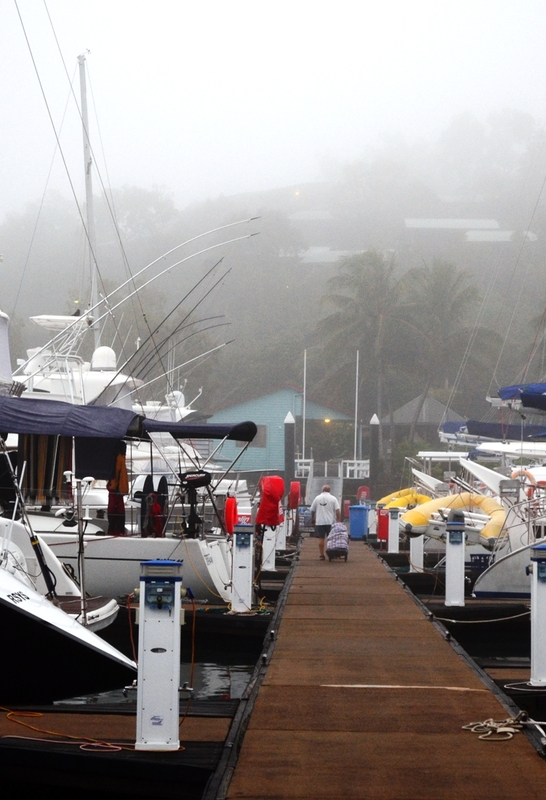 Daniel now works for the Hamilton Island Marina assisting the coming and going of boats. There have been a few other people that have stopped for a chit chat on their walk down the marina finger. Sometimes it is AR that catches their eye, sometimes it is my herb garden on the back step that draws their attention or sometime it is just because we are there on deck or in the cockpit and make time to say G’day. With all our washing finished and a bit of sun shining through the clouds, MrJ and I went for a walk to the other side of the marina/waterfront complex. Like we really need to be doing more walking after how many trips to the laundry and office to get money changed for the machines over these past two days. This time the walking was for enjoyment not for working, there’s the difference. I just love how the main mode of transport on Hamo Island is by golf buggy; hundreds of them and such a great idea for everyone to be able to get around, for a price of course. Another way to get around the island is by the free bus service which does a complete loop of the whole island and runs continually all day enabling anyone to hop on and off when and where they like. The esplanade along the marina waterfront is known as the Marina Village and it is where the shops are located. 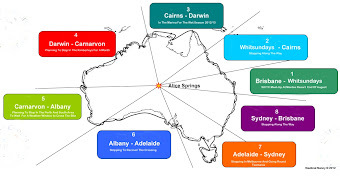 There is a general store/newsagents, a supermarket, a Post Office, boutiques, a Dive Shop, a Real Estate, a bakery, a fish shop, gift shops, a Ice-creamery, restaurants, a pub, art galleries, cafes, boat hire. 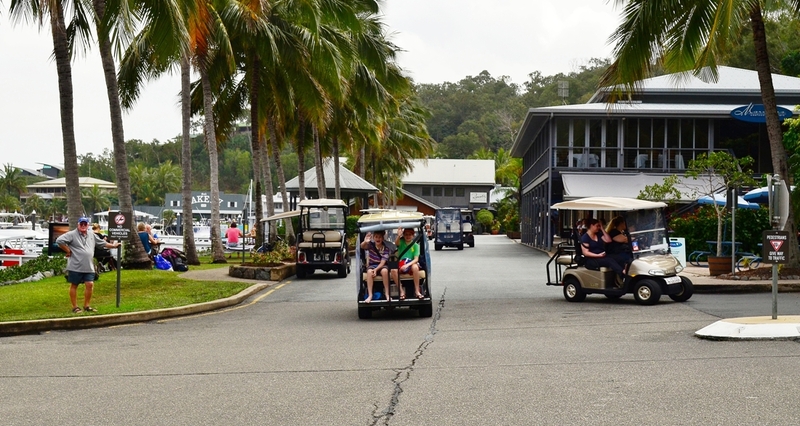 At one end of the long road is the marina office and work yards, at the other end sitting out over the water is the famous Hamilton Island Yacht Club with its unique marine architectural design. 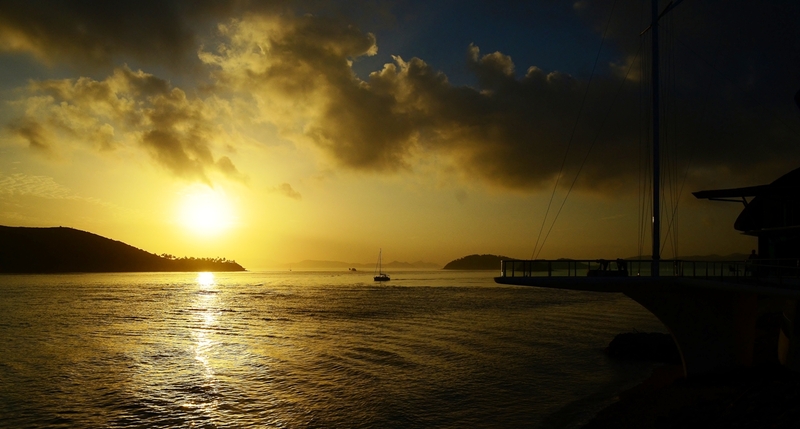 The Hamilton Island Yacht Club was designed by Australian architect Walter Barda, a distinctive and authentic Australian style. The design features a tarnished copper roof of aquamarine leaves encasing three levels of vast facilities; the shape of the roof is inspired by soaring silhouettes of full sails. The decks are expansive cantilevered terraces that stretch over the waters of the Marina and Dent Passage. The main deck is called the Bommie Deck which does have the look/feel of a rock bommie sitting out away from the main structure but joined by the deck and there is the Mast Head Deck which has a tall mast and rigging as its centre feature and a “to die for” sunset view out over the Dent Passage. A true celebration of marine lifestyle! Saturday evening, last night in, MrJ and I do sundowners on the deck of the Yacht Club (absolutely gorgeous) before dinning at Manta Ray Cafe for one of their gourmet pizzas in a totally laid-back atmosphere. The cafe’s outside deck overlooks the marina with its display of numerous boats and in the evenings the colourful night lights of the Marina Village reflect across the water. The Manta Ray Cafe also served local seafood, meaty mains and Italian pasta dishes and drinks are served in the sociable bar. This morning, Sunday morning has brought in a little fog which lifted as the strong winds bullet around the hill. 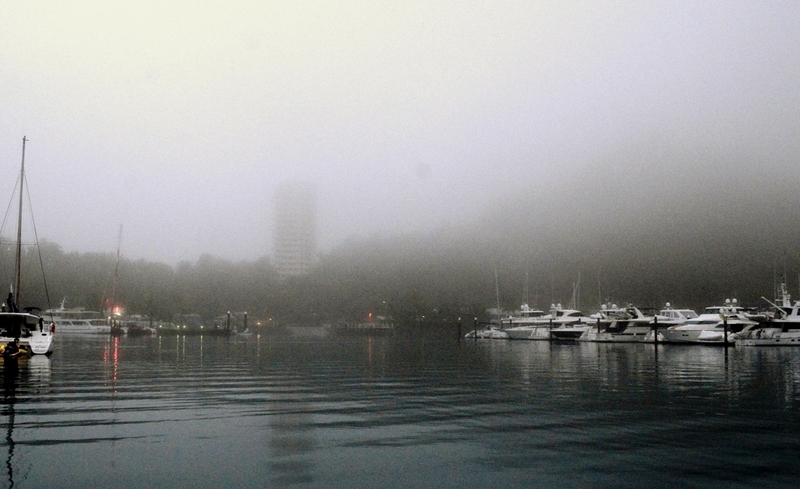 Now it is time for us to leave and find new anchorages out there in the islands amongst the grey mist and rain. I will post some more pictures when we are safely anchored somewhere, sometime later today.